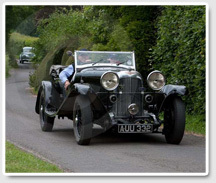 The East Clandon Classic Car Tour was the inspiration of Dutchman Paul Kranendonk back in 2006, who was at that time a resident of the village. 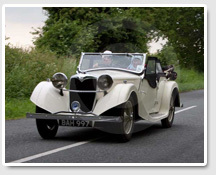 He found the local hilly English countryside fascinating and was also a classic car enthusiast. He recruited Ray Corstin to help develop a “classic” car event that would allow like-minded souls to enjoy the same interests and to explore the local counties. The definition of “Classic” is deliberately elastic to allow cars that, in the opinion of the organisers, “are interesting”. In past years the Tour has visited Surrey, East Hampshire, West Sussex and Berkshire. A typical format is breakfast at the Queen’s Head pub, including the briefing and then the departure of the cars, usually oldest first! About 2 hours driving, mainly on back roads through the prettiest parts of the chosen area, brings the lunch stop at a pub carefully chosen to accommodate the cars and the essential needs of drivers and navigators. After this leisurely stop the return journey usually (some navigators have been known to be less sharp after sampling local ales) brings cars back to the Queen’s Head at about 5 o’clock in the afternoon. A champagne reception greets the crews together with a test of their observational powers on the Tour and the inspection of the cars by the infamous “Marigold Maids” whose task is to select the “best” car. The criteria for this competition are a closely guarded secret known only to the said Maids! After the competitions, Mark Williams and his team at the Queen’s Head host a relaxed dinner for entrants and friends, culminating in a prize-giving with awards ranging from the Victor’s laurel wreath to the Rusty Spanner. There are usually around 20 participating cars of diverse origins with some colourful character owners. The routes chosen have been well received and the questions not too challenging for the observant. The social and low key nature of the event has made for a most enjoyable day in beautiful Southern English countryside. Several members of the village have helped with the organising over the years and we hope that the event will continue for many years. If you are interested in participating in future years, please pass your contact details to Paul Richardson at paul.richardson@gopherit.us or Roger Nickolds at rogernickolds@gmail.com.